The Most Original Leather Safety Cat Collars (4) - Superpipapo: In Style with Your Pet! A pretty special design leather cat collar. The blue leather patches are the waves in which the goldfishes for your cat swim. This custom leather collar for your cat is a happy design with leather patches in various attractive colors green, purple, and pink. 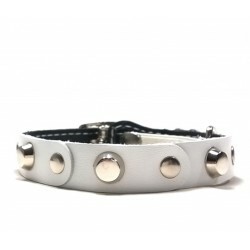 With this leather cat collar with studs, safety clasp and Red Coral style Polaris stones your cat is cool and trendy looking! 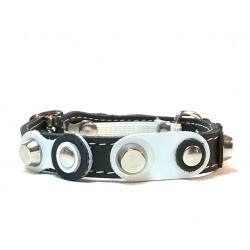 A great and cool cat collar with beautiful black and white leather patches and cool rivets. Fancy Leather Cat Collar with Fuchsia Leather pieces and Studs. This fancy leather cat collar design combines robust rivets with beautiful color leather patches available in different colors. Surely there will be a perfect looking collar for your cat! This original and different leather Flowerpower Cat Collar has beautiful leather patches and colored flowers. It is available in different colors! Flower-Power Cat Collar with Pink and Purple Leather. This original and different leather Flower-power Cat Collar has beautiful leather patches and colored flowers. It is available in different colors! 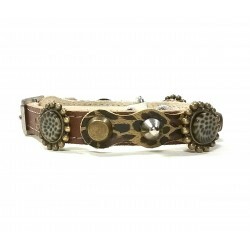 This original and different leather Flowerpower Cat Collar has beautiful leather patches and colored flowers. It is available in different colors that you can see in the last picture. Dit originele en mooie flower power kattenhalsbandje van leer heeft mooie lederen patches en gekleurde bloemen. Hij is verkrijgbaar in verschillende kleuren die je kunt zien op de laatste foto. 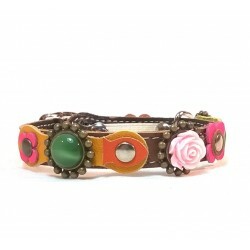 Cat Collar Flower-Power with Brown White and Green Leather. This original and different leather Flowerpower Cat Collar has beautiful leather patches and colored flowers. It is available in different colors!